It’s amazing how heavy a bag can become when you throw in a few gadgets. Backpacks are by far the most comfortable way to carry heavy loads, but they do have a few drawbacks. Most commonly is they aren’t the most convenient of things to access. If you want to pull out your iPad or a camera, for example, you have to remove the backpack and either put it down somewhere or awkwardly hold it in one hand while wrestling with zips with the other. Introducing Wolffepack, the world’s first orbital backpack, an award-winning innovation that swings your gear round to the front with the bag still strapped to your back. 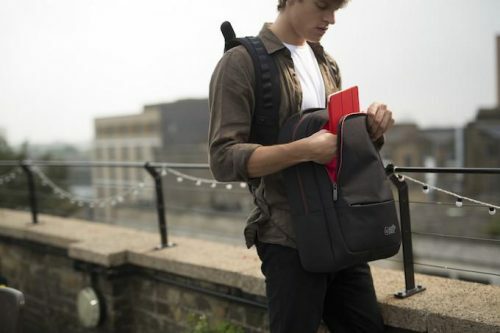 This lets you access all your things and gears without the inconvenience of removing your backpack or putting it down. The top featured point of the Wolffepack is that you can lower the backpack behind you, then swing it round in front of you for easy access, where it clips in place. This gives you easy access to all your gear using only one hand and no need to unstrap or take the pack off. Using the black plastic handle on the right strap. Unclip this from its holder, pull down the handle and then allow it to retract up into a slot by your shoulder and the backpack lowers down behind you. This allows you to swing it in front of you. You can then hook it on to the front of the shoulder straps, leaving your hands completely free to work out of your bag, whether that’s for a lens change, or to search for something inside the bag. Inside, the Wolffepack is well-appointed for gadgets. There’s a main padded section suitable for a 15-inch MacBook Pro, as well as a second padded section ideal for an iPad. On the other side are a couple of open pockets that can accommodate things like a power pack or compact camera. There’s also a zipped pocket suitable for easy-to-lose things like USB and keys. That still leaves the main compartment free for a sweater, file folder or similar. The outside of the bag has two more zipped compartments. The larger of the two also has multiple compartments, and actually felt like overkill, while there’s a smaller one suitable for small common things you usually use. Finally there’s a compact umbrella/water bottle slot on the side. Made from high quality durable materials include water-resistant high grade polyester fabric, gunmetal zipper pulls, carbon fiber, kevlar components, super strong Dyneema cords and soft microfiber-lined sleeve pads makes the Wolffepack offering the greatest security ever for your valuables. Additionally, you can take control of your valuables by moving them round to your front when you feel at risk. Be more relaxed and confident in markets, queues, crowds and public transport with your valuables in sight. The Wolffepack also has wide, padded sculpted straps for extra comfort, plus an airflow back channel. The structure of the EVA foam padded harness means that your stuff sits perfectly against your back for a comfortable carry.